The latest novel by Peter Gadol is now out and I am thrilled to be able to share a preview with everyone! This is psychological suspense novel is not Gadol’s first book and judging from the preview, you can tell it’s going to be an interesting story. 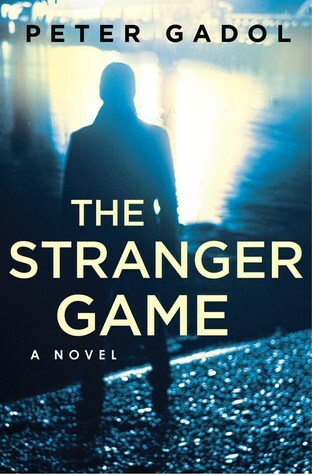 A thought-provoking, haunting novel, The Stranger Gameunearths the connections, both imagined and real, that we build with the people around us in the physical and digital world, and where the boundaries blur between them (summary from Goodreads). The first time I followed anyone was on a Sunday afternoon in late November, the sky still gray with ash some weeks after a wildfire to the north. I had gone out on a hike, hoping to clear my mind by scrambling up the narrow path of a dry canyon, which worked until I walked the down trail back to my car. As I was driving out of the park, I passed a picnic area where there was a party underway, a birthday celebration with a hacked-at piñata twirling off a low branch, smoke rising from black­ened grills, balloons tethered to the benches. At the pe­riphery, I noticed a little boy, himself a balloon in a red, round jacket and red, round pants. He didn’t seem to be the center of attention, so I didn’t think he was the birth­day boy. He must have been about three. He was tossing an inflated ball, also red, back and forth to his parents, or not exactly to his parents. He launched the ball in­stead toward the road where I’d pulled over and parked. I hadn’t planned any of this, but then that was how the game was played, how it began, the first rule: choose your subjects at random. The balloon boy picked up the ball and tried throw­ing it again, but he couldn’t seem to get it to either par­ent; it kept falling short. Why didn’t they stand closer? Why were they making it difficult for him, was this some kind of test? The boy began flapping his arms, exasper­ated, until mercifully his mother pulled him aside for a hot dog. The boy’s father accepted a beer from another man. Trying to persuade the boy to eat was apparently the wrong move because he shook his head from side to side, cranky right when the afternoon sun both cracked the clouds and began to fade. The boy’s mother scooped him up in her arms, al­though it looked like he was getting heavy for her, and carried him to a bright green box of a car parked three spaces in front of mine. Did she notice me? No, why would she? There was nothing so peculiar about a forty-year-old woman sitting alone in a gray car idling in a city park. Although that afternoon I was full of longing, and who really knew what I was capable of doing. The mother fit her boy into a car seat, strapped him in, and brushed his hair off his face. The boy’s father had followed them to the car but didn’t get in. The woman turned toward him to give him a quick, meaningful kiss, and I heard the man shout as he walked away that he’d call her later when he got home, which elicited an easy smile from the woman. I revised my story. She was a single mother, right now only dating this man; she’d brought her son to a party the man had said the boy might enjoy. The woman and the man had been seeing each other for six months, and he was the first guy in a long while who she felt was good with her son, better than the boy’s actual father. I should have been rooting for them, for their happiness, but I wondered: If the woman and man wound up to­gether permanently, would he be one of those guys who believed their marriage wouldn’t be complete until she gave him a child of his own? How would the woman’s son handle it? Would the challenge of a new sibling pre­pare him for all of the other uncertainties ahead, his body changing, the girls or the boys he’d want to take to his own picnics, the inevitable dramas of his own making? Would he continue wearing red jackets with red pants? Would he come into his body as an athlete, or would he excel at piano or math or debate, or all of the above—no, something else, but what? These were the questions I was asking while trailing the green car out of the park and east along the boule­vard, then south, skirting downtown. Traffic gave me cover, but it also meant I had to drive aggressively if I didn’t want to lose them. There was an unexpected plea­sure in trying to remain unobserved while in pursuit. Twenty minutes later, we ended up on the east side of the river heading into a part of the city I didn’t know well, and as traffic thinned, it had to be obvious I was behind them. Did the woman see me in her mirror? Did she call her boyfriend and chatter for the sake of it, keeping him on the line in case she needed to tell him a woman wearing dark glasses was following her home? We were coasting through a newer development, the streets as flat as their map. When the woman turned into a driveway, I continued on and pulled over at the end of the block, five houses away. Now I watched them in my side-view mirror: the woman helped the boy out of the back seat, and she was trying to gather their things and order him into the house, but he was having none of it, sprinting across the yard toward its one leafless tree. Then the boy tripped. He fell first on his knees, then his palms. He wailed. The woman jogged over and knelt down next to him, righting him, shaking her head, neither angry nor con­cerned. It wasn’t a bad fall. She reached her arms around him and once again she brushed his bangs across his forehead. The boy probably had learned that the longer he wept, the longer his mother would hold him, and so he kept crying. His mother rocked him—and was she smiling? How long would she be able to comfort him like this, her silly boy? I wondered what it was like to be needed in this way, and to know it was a fleeting de­pendence. The autumn sky turned amber with the last trace of light. Suddenly from the open back door of the woman’s car, the red ball fell out. It rolled all the way down the driveway to the street. Neither the woman nor her son appeared to notice. The breeze carried the ball down the grade toward where I was parked. My first instinct was to hop out and retrieve it and bring it back to the boy, but then I would have revealed my position and possi­bly alarmed the woman if she put together how far I’d followed her. Also I would have broken the second rule of the game: no contact. The red ball continued to roll down the middle of the street, pushed on by the evening wind. Would the boy ever find it? Would his mother notice it missing? Was it lost for good? I would never know. I would never see them again. The third rule of the game was never follow the same stranger twice, and so I drove away.